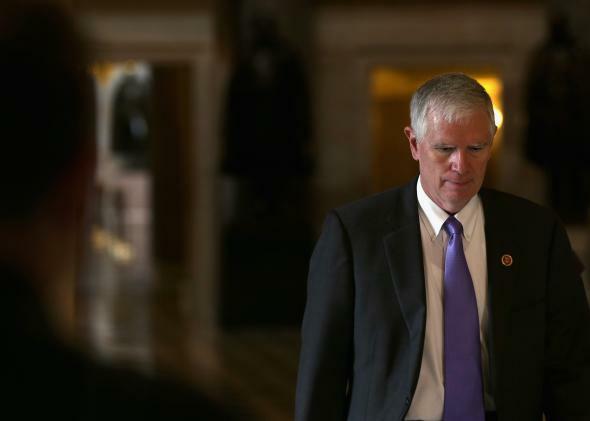 Alabama Rep. Mo Brooks says Obama’s executive action over immigration could prompt impeachment or prison time. U.S. Rep. Mo Brooks (R-AL) thinks the president might be about to commit a felony. Conservatives hate everything about the president’s imminent immigration move, starting with its timing, and one House member is hinting that the executive action could result in impeachment, and maybe even prison time. President Obama is expected to announce his executive action on immigration—a move which could defer deportations for as many as 5 million undocumented immigrants—on Thursday. Alabama Rep. Mo Brooks, one of the lower chamber’s most energetic critics of comprehensive immigration reform, suggested that the president’s move could potentially be grounds for impeachment, or even prison time. Brooks said there is a federal statute (“I don’t have the citation for it at the tip of my tongue”) making it a felony to aid, abet, or entice a foreigner to illegally enter the U.S.
Brooks isn’t sure on what grounds impeachment proceedings might be justified because he hasn’t seen the outlines of the president’s actions yet. “If the president is simply not obeying a statute that is noncriminal in nature, that does not necessarily rise to a high crime or a misdemeanor,” Brooks said. The president isn’t going to be impeached, or be sent to jail for five years. But he is definitely going to upset a lot of Republicans. After Thursday’s announcement, Obama will travel to Las Vegas on Friday to try to build support for the move. Congress’s Thanksgiving recess is set to begin a few hours before the president’s statement. His decision to hold off on announcing the action until most members leave town has left some Republicans feeling rankled. Arizona Republican Rep. Paul Gosar said his timing is part of a pattern. Gosar added that the White House also dumped documents on the Benghazi and “Fast and Furious” controversies on Fridays. “It shows the cowardice of the president,” she said.